It used to be that I would have a "make up" day when it came to house cleaning and laundry–a day when my sole purpose in life would be to make a dent in (notice I didn't say finish) the laundry, get everything put away properly, things wiped down and mopped, and prettied up. I was making up for all the previous days when I ignored the spaces and piles around me. But I'm realizing lately that my time is not completely my own. I can't put things off for tomorrow or let things go so easily as I used to. It's taking more of a daily effort, little spurts of cleaning and puttering when I can find them. I'm trying to streamline, especially my time in the mornings. There are things that need to be done: the chickens and guineas fed, children fed, a run of the dishwasher, a load of laundry, a quick tidy, things watered and picked, before I thrust myself into the meat of my day. I read a post on Simple Mom about your morning five. Making a list of the five things you need to accomplish each morning. (At least I think I read it on Simple Mom. Am I making this up? Nope found it here.) The recommendation is to have five things you do the same every morning. Your routine. I love this idea and I need to really put what's swirling around in my head into a tidy list on a piece of paper. I love routine and crave it more in my life. Living on the farm with my grandmother the past two and a half years has made me realize how much wisdom and peaceful simplicity there is in routine. Of course, all work and no play makes Johnny a dull boy. Or me a frazzled, weak, tear-stained pile of stress on the floor. Enter my sweet little bag of knitting. Knitting is bringing me more comfort and peace these days than it has in a long time. Not only does it calm me, I find it also calms my children. When I sit myself down in a comfy chair in the living room to work and be still, my children seem to always wander in to the same room and find a place to play. They pick up a book and climb under blankets and pillows on the sofa, they lay on their bellies and disappear into a land of make-believe with their toys. As much as it is important for them to see me as industrious and organized, caring for our home. It is important for them to see me still and quiet and creative. It's an equally important memory and "skill" to pass on to my children. 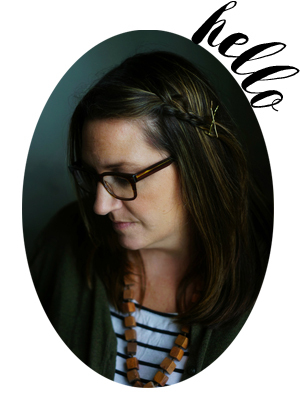 And just another word about SimpleMom….if you're not subscribing to it, you're missing out. Every blog post that shows up in my inbox is something I find practical and helpful to my every day. Be sure to take a moment to visit. And another (shameless) thing…if you happen to click out of your feedreader and actually visit my blog today, there's a little button over there on the left-hand sidebar to vote for my blog. It was nominated for "best parenting blog" in this year's Blogger's Choice Awards. And I have only one vote. And I'm pretty sure it's from my sister. Vote here. Thank you for turning me onto Simple Mom. It will help me gather resources for my life. I have recently started a campaign in my family called The Simplicity Project (TSP). Your post today resonates with me. Um let’s see I seriously think using power tools like my DeWalt oscillating sander relaxes me. Maybe the noise cancels everything else out? On the chill side I like to swing on a swing for two, lakeside. routine is good. i find the better i am at sticking to a routine, the more i get done. that said, off to do laundry! i’ve been re-reading “gilead” by marilynne robinson. even one page/day is refreshing. we found our stride with early rising (5am) and to bed by 10. i need a few hours before my kids wake up…to do “my morning 5”. i’m struggling with my ‘5’ and my daily routines as well. 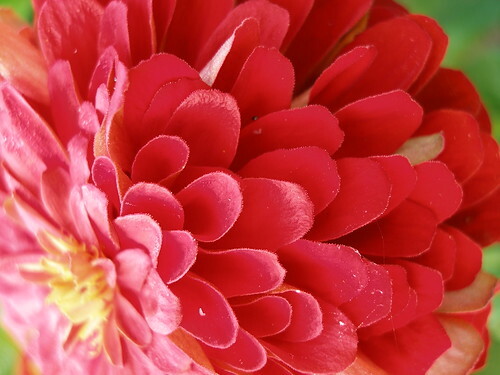 i love your macro flower photo – that would look so great blown up! my morning routine is pretty much the same every day, especially now that the kids are in school. it is refreshing. coffee, breakfast, lunches, dishes, sit and knit for a few minutes after everyone leaves the house. yes, knitting is wonderful for the whole family. 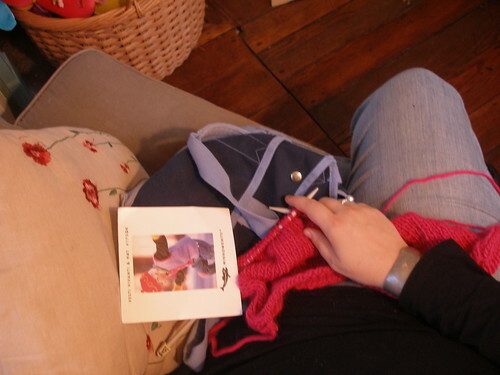 my kids get very quiet, usually do something creative themselves like drawing or painting while i sit and knit. it’s a good thing. I haven’t heard about Simple Mom until today…definitely helpful! My morning routine has gotten really messed up due to illness and things- and the space of being ill has actually made me really reconsider a lot of what I do every day. I am slowly working towards a morning routine that finds me having a bit of creative time and quiet time before the kids get up, and three basic chores done before the homeschool day begins: laundry started, dishwasher loaded and started, and the beds made. The rest of it, I have decided, can wait until the littles are down for naps and the older boys are taking their reading time. And even then, I am only taking about half an hour to focus on one room (like dusting, picking up, decluttering the living room) and spending the other half an hour ‘finishing’ the chores I started in the morning. I have managed to still have another 20-30 minutes or so to just recenter and read a book or whatever I need. I need routine it is what gets me through the week also without breaking down in tears. It’s nice to know there are other people out there who have the same stuggles with house keeping and routine that I do. I read blogs where it seems that some moms have all the time in the world, and it makes me wonder if I’m doing something wrong. I love that you confess that you can sometimes be a “tear-stained pile of stress.” I now know that I have a comrade, and that gives me comfort. I’ve been working on my morning routine for a while now…load of laundry in, unload the dishwasher, tidy up from breakfast are the most important for me. I also have an afternoon list and an evening list of just a few little things to do that keep life from getting out of control. I’ll have to check out the SimpleMom site. Thank you! and yes. yes, yes, yes. i have thought SO much about this subject of my children seeing me be still. be not scurrying and moving and multitasking all of the time. i want them to learn that stillness so badly. and i want to find more of it. so badly. I’m finding some quiet time late at night–crafting, reading. Tonight I’m watching tv. I’m done working for the day, and waiting for Criminal Minds to come on! hello! just found your blog and L O V E it!have you ever heard of “flylady”? http://www.flylady.netHer system is just what you’re describing. She promotes a morning routine, afternoon routine, and a before bed routine. It’s helped me so much. thanks for all your honest and heartfelt posts! Hi! I’ve gotten out of my usual routine this summer but am hoping to get back into a good one now that it’s fall. It was nice to spend a few months routine-less though. Now I’m ready for structure, but am also seeing how some of my previous routine didn’t really work all that well. 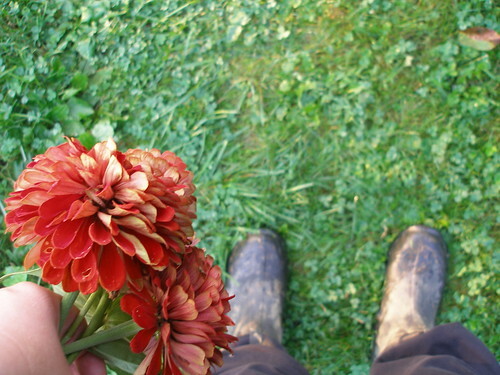 Thank you for mentioning simple mom… I just spent the whole evening on her blog and love it. I can’t believe how many great ideas she’s got. Talk about being organized!!! I love having a routine it saves my house from looking like… um… what it looks like at this very moment. Great photos of the Mums… aaaaa lovely! Last year I found a battered copy of Little House in the Big Woods, never seen it before, and I opened the front cover and fell in love with the first page..
‘Each day has its own proper work,’ Laura’s Ma used to say. It conjured up such a sense of calm and order. It also made me slightly concerned that we seem to be living in perpetual Mondays and Fridays! My grandmother also ran her brood by a weekly routine and I think that’s what I’m going to aim for…aside from the obvious daily chores. Husband would not be best pleased if I only did the dishes 1 day a week! A daily 5 would include 15mins in blogland to find inspired wisdom from the likes of you! Consider yourself voted for! I will have to check out the simple mom website, sounds great.Routine… ah.. I crave a bit more of it in my life.Lovely post. Without morning exercise, I am in a bad mood most of the day. I never used to be this way. Now I’m hooked on whatever good chemicals come from exercise. This routine would no doubt be 50 times more difficult if I were getting ready for a day of homeschooling every day. That’s hard work! I hope you get your groove going soon. I’ve been thinking a lot about knitting lately. I think I miss the quiet of the craft, thank you for reminding me of that. I know exactly what you mean when you refer to the comfort of routine and rhythm, I feel exactly that when I’m able to create a rhythm in our house. Its taken years for it to really sink in that I create the rhythm, but its really true. Hi Molly,I have been enjoying knitting a lot lately. Although, if the pattern involves too much counting, I have to do that later in the evening when the boys are sleeping. At ages 2 1/2, and 4 1/2, quiet moments have been pretty scarce.I’ve been drawing more lately too, which really calms me.